ALAMEDA, Calif. — A local Coast Guard crew returned to Alameda after they seized more than $183 million worth of illegal narcotics during a 140-day deployment Monday. The crew of the Coast Guard Cutter Bertholf was deployed to the Eastern Pacific Ocean off the coast of Central and South America in support of Joint Interagency Task Force-South counter-drug operations. During the deployment, Bertholf’s crew detained a number of suspicious vessels and suspects and seized more than 12,000 pounds of illegal narcotics. “Because our missions were a success, it made coming home even better,” said Capt. Mark Frankford, commanding officer of the Bertholf. Crewmembers took time from the busy patrol to volunteer at an assisted living facility in Puerto Vallarta, Mexico, where they performed maintenance, upkeep and visited with the residents, many of who were elderly. This volunteer effort helped improve the quality of life for the residents at the facility. Capt. Mark Frankford commands the Cutter Bertholf. Bertholf’s crew routinely conducts operations from South America to the Bering Sea where the cutter’s unmatched combination of range, speed, and ability to operate in extreme weather provide the mission flexibility necessary to conduct alien migrant interdiction operations, domestic fisheries protection, search and rescue, counter-narcotics and other Coast Guard missions at great distances from shore keeping threats far from the U.S. mainland. 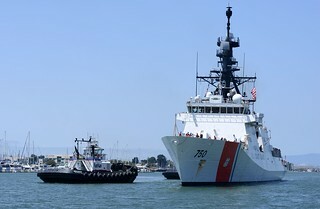 U.S. maritime law enforcement and the interdiction phase of counter-smuggling operations in the Eastern Pacific occurs under the tactical control of the 11th Coast Guard District in Alameda. The 11th Coast Guard District encompasses the states of California, Arizona, Nevada and Utah, the coastal and offshore waters out more than 1,000 miles and the offshore waters of Mexico and Central America down to South America. Joint Interagency Task Force South, a National Task Force under U.S. Southern Command, oversees the detection and monitoring of illicit traffickers and assists U.S. and multi-national law enforcement agencies with the interdiction of these illicit traffickers. During at-sea busts in international waters, these interdictions are led and conducted by U.S. Coast Guard personnel or partner nation law enforcement agencies. Click the photo for more of the homecoming.